Earlier this month an underground fire knocked out cable for a big chunk of the East Village in NYC. Remember that whole #fixcable thing from this summer? Well this is what it looks like when they literally fix cable. Basically, what happened on October 6th was a steam pipe sprang a leak, which shorted out some electrical wiring, which caused a fire, which melted the bejeezus out of Time Warner's fiber-optic cable and knocked out cable services for over a hundred nodes. Considering a single node provides services to 300 to 600 customers, that's no small outage. 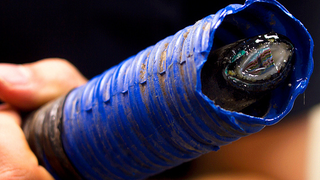 Time Warner's Untangled blog has a cool photographic tour of the crazy, twisted world of underground cable, and it's definitely worth the quick read.